After her brief fling with the Green Party, Sue Bradford settled back into her old patterns, organising demos, getting arrested and running the Auckland Unemployed Workers Rights Centre. In January 1991 she led a sit in at the US Consulate in Auckland after the first Iraq war broke out. In February she was prominent at an Auckland march against benefit cuts at which the Communist Party displayed their "Build a United Front of Labour - Communist Party" banner. In May she helped organise an AUWRC demo outside the Auckland National Party offices. The same month, Bradford was involved in an AUWRC gatecrash of an economics seminar at the Hyatt ballroom where Rob Storey was delivering a speech on behalf of Ruth Richardson. She also set up an AUWRC soup kitchen outside the Aotea Centre as patrons arrived for the opening night of Les Miserables. In November, Bradford was involved in an AUWRC trespass onto the lawn of Sir Michael Fay's Mission Bay mansion where a plastic and bamboo shanty was erected. The pattern continued in 1992 with demos outside an economics conference at the Pan Pacific Hotel, outside the 1ZB studios where Jim Bolger was on talkback radio and outside the National Party Annual Conference at the Downtown Convention Centre. While the Workers Communist League was no more and its successor "Left Currents" had also faded into the background, Bradford still worked closely with many of her old Maoist comrades. In August 1992 she addressed a meeting of Auckland Uni's neo-Maoist Radical Society (led by ex WCL supporter Bruce Cronin), on ousting the National Government. She also contributed articles to "Labour Notes", a journal run by ex WCLers. As head of the Auckland Peoples Centre Bradford worked with several ex WCLers on the staff and with People's Centres in other towns, all run by ex WCL types. In November 1992, Bradford spoke at conference at the WEA Centre in Christchurch "Building for Real Political Change", run by the Campaign for People's Sovereignty. This group was made of various Christchurch organisations, including Murray Horton's Campaign Against Foreign Control of Aotearoa. In 1993, Bradford stood for parliament on an AUWRC ticket. She told Metro of May 1993 "a parliamentary seat has long been a personal ambition." One of her fellow AUWRC candidates was Stan (Steve) Hieatt, a former member of the Communist Party and the Workers Communist League. In 1993, the Campaign for People's Sovereignty, former WCL members, neo Maoist students and radical Catholics began working towards a new movement. This was inspired by partly by a document written in 1991 by the Justice, Peace and Service Unit of the Conference of Churches of Aotearoa/NZ entitled "Let's Build Our Own Future". In November 1993, Bradford attended the Wellington Peoples Assembly where she spoke about the new Peoples Charter Movement. This was part of the Building Our Own Futures Project (BOOF), a network of radical groups inspired by CPS, CAFCA, the People's Select Committee, the 1993 Peace, Power and Politics Conference and the People's Plan for the 21st Century (PP21). PP21, was and is an Asian wide network of radical groups, mainly Maoist orientated or infiltrated. Some of the dozens of affiliated organisations have included the Asian Students Association, the Asian Cultural Forum on Development, Asia Pacific Workers Solidarity Links, Asian Alliance of YMCAs, Asian Centre for the Progress of Peoples, Child Workers in Asia, Third World Network, Asia-South Pacific Bureau for Adult Education. Robert Reid, one time Workers Communist League's international officer, was on the regional Co-rdinating Team for PP21. According to the BOOF introductory booklet "PP21 was the international inspiration for the Peoples Assembly and the ongoing activity and more than a dozen people from Aoteoroa have been involved in International PP21 activities". Reid was member of the BOOF/People's Assembly National Organising Group as was Sue Bradford. Other WCL linked activists on the National Organising Group were Maxine Gay and Quentin Jukes. Alistair Shaw from Radical Society and the Aotearoa Youth Network, was also a member as were Joss Debreceny and Lisa Beech from AYN. Several Catholic activists including radical priest Jeff Drane and Dunedin nun, Josie Dolan were also members. The BOOF/People's Assembly movement worked with several offshoots and allied organisations, including the Aotearoa Youth Network, the Activism in Aotearoa conferences and the Aotearoa Network of Unemployed and Beneficiaries (ANUB). 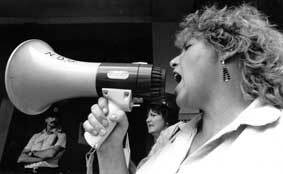 In March 1994, Sue Bradford was arrested with eleven others, for trespass at an ANUB organised demo at the Reserve Bank in Wellington. Hi Trevor, I enjoy your profiles, but must admit to getting a bit lost with just what are the differences between Maoist/Marxist/Leninist/Trotskyites etc. any plans on an article on extremist factions for beginners? A good idea anon. I will work on it. You are wrong about Sue Bradford being a nice lady. She is nasty to anyone who has a contrary view. She's a gutsy, no-nonsense person who stands up for what she belives. And she's right of course, which helps. Privacy for Paedophiles? Piss Off!